All hats are made up of three main parts – the crown, the band and the brim, and the different combinations of these make up the majority of headwear. The crown of your hat is the top part, the band is in the middle, and the brim is the edge of your hat. 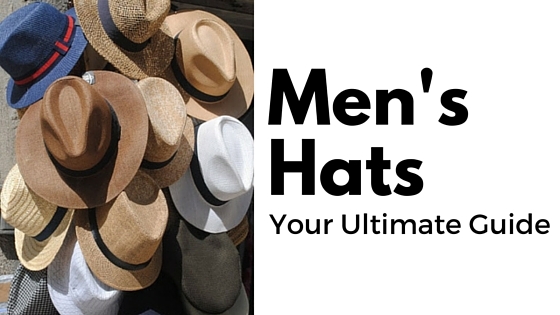 So which type of hat is for you this summer? Try on a couple of different styles before you commit – depending on your head, face and personal preference you might find that you suit a range of hats, or are better sticking to one distinct style. The trick to hats is wearing them with confidence. A Panama hat is one of the most popular men's hats for the summer, which is made from straw (named after the panama straw from South America where it comes from) with a slight crease in the crown. It has a medium brim which makes it a very versatile and practical hat for keeping your head cool when the sun is blazing. It often comes with a medium thickness band of colour, so it can be matched to any summer outfit for a completely co-ordinated look. This is another example of a straw hat made popular in the 1950s, however it is made with stiff straw instead of panama straw and has a smaller brim and a flat top. They have not benefitted from the same revival as the Panama hat, and can therefore been seen as slightly old fashioned so if you are deciding between the two, our recommendation would be to go with the Panama hat. This is a classic hat with a stiff brim at the front, which can be seen on everyone from kids in the park to celebrities of both genders. It’s widely accepted as a casual hat style, so don’t wear this anywhere except informal settings. The large brim is perfect for keeping the sun out of your eyes in the summer, and it’s available in every style, colour and design you can think of – you can even design your own custom hat. While the name might not make it sound too appealing this hat style is enjoying a comeback along with other key iconic style pieces of the 90s. This soft cloth hat with a small floppy brim is best left to the Britpop bands of the 90s as far as we’re concerned. Come hail or shine, summer or winter, the beanie is universally accepted as being the most versatile hat on the planet. This brimless hat is made from soft cloth sewn together to make a knitted style cap. Not for everyone though, some men find that the head-hugging beanie doesn’t suit their head or face shape.